There are a lot of changes happening at Hi-Crush right now. Here's the skinny on what matters to investors. Check out the latest Hi-Crush earnings call transcript. For the past several months, frack sand producer Hi-Crush Partners (NYSE:HCLP) has been hinting at some major changes to its business -- from its decision to pay a huge distribution, to buying out the controlling partner's stake, and then announcing it was changing from a master limited partnership to a conventional C-corporation. All of these changes, in addition to the wild ups and downs of the frack sand market, probably have investors wondering what's going on and what to expect in the future. To help investors get a better idea of what's going on, here are a few pertinent messages from management's most recent quarterly conference call and what investors should make of all these recent changes. Hi-Crush was initially set up as a master limited partnership because supplying sand to the oil and gas industry initially looked like a relatively stable revenue business that would benefit from the tax-advantaged structure MLPs provide. As the shale boom has taken off, though, it's been a wild ride for sand suppliers, as prices have fluctuated wildly. Also, with recent changes to the tax code at the beginning of 2018, the advantage of being an MLP isn't nearly as great as it once was. These are part of the reason Hi-Crush has elected to convert from an MLP to a conventional C-corporation. On the call, CEO Robert Rasmus went into detail why he believes now is the time to change the corporate structure. [W]hile the MLP model no doubt played a critical role in getting us to where we are today, the next phase of our growth will be driven by different factors and will require flexibility not afforded under the MLP structure. To facilitate the long-term success of our business and to ensure the flexibility necessary to do so, the optimal structure for us is the C-corp, and we've, therefore, been focused on progressing toward conversion. There are some standard reasons Hi-Crush and other MLPs make a move like this, such as opening themselves to more institutional investors, or allowing the stock to be held in retirement accounts without tax penalties. The two reasons that stand out from Rasmus' comments, though, are the ability for Hi-Crush to lower its cost of capital and the fact that it's starting to generate more revenue from business that doesn't qualify under the MLP structure. In this case, "a lower cost of capital" is probably a veiled way of saying its payout won't be as generous as it was under the MLP structure. Also, with its last-mile logistics services expanding, those logistics and services revenues would be taxed as regular income. With all of these factors working against it, it makes sense for Hi-Crush to shed its MLP structure, even if it means investors take a big hit today. In August, the market began to experience a rapid change in conditions, driving a reduction in demand and pricing for [frack] sand. This quick-to-emerge dynamic was spurred by several factors, including E&P [exploration and production] budget exhaustion, early achievement of E&P production targets, concerns related to pipeline takeaway capacity in the Permian, and efficiency-driven gaps in completion schedules. We consider some of these factors to be transitory, and we expect some of these headwinds will reverse as E&P budgets reset with the new year, takeaway capacity comes online in the back half of 2019, and inventories of DUCs [drilled, uncompleted wells] are worked down. Rasmus made those comments at the end of the third quarter, and oil prices have slid significantly since then. That could delay when oil producers decide to open up their wallets again, but one important lesson from this year is how quickly conditions can change in the oil market with shale in the mix. We expect improvements in our production cost per ton in the fourth quarter of 2018 with the idling of our Whitehall facility. However, the impact on our contribution margin per ton will be largely overshadowed by the impact of reduced pricing. Given where we see pricing today and continuing in the fourth quarter, we are expecting our contribution margin per ton to decline by $8 to $10 per ton from the average realized in the third quarter, and likely be in the low teens. For comparison, Hi-Crush's contribution margin for the third quarter was $23 per ton. So we're looking at $13 to $15 in the fourth quarter. We can also expect lower volumes as the company has shuttered its Whitehall facility. It won't be a good quarter by any means, but it doesn't look nearly as bad as what we saw in 2015 and 2016. Hi-Crush has some aspects that make could make it a compelling investment. It has a considerable amount of in-basin supply that can serve red-hot shale basins such as the Permian Basin at relatively low cost. It is signing customers up with long-term supply contracts that will help to ensure more stable revenue, and its last-mile logistics services is gaining traction and boosting per-ton margins. The one thing that should make investors hesitant about this stock is the transition from an MLP to a C-corp. Typically, a transaction like that is a taxable event that could cost investors some cash should they buy today. Also, since the company has yet to put out a definitive plan on how it plans to shed its MLP structure, we don't know how favorable, or unfavorable, the deal might be for investors. 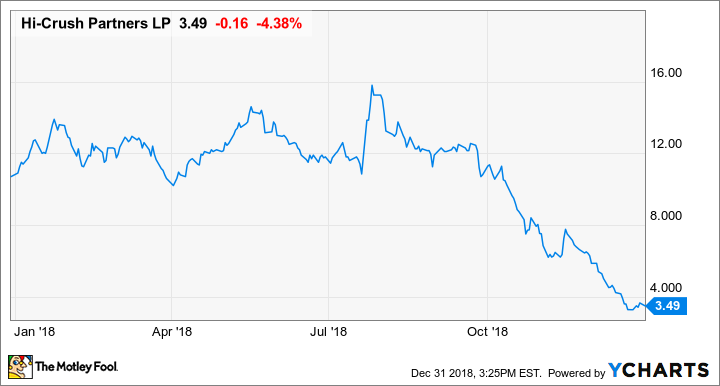 So for now, it's probably best to sit on the sidelines to see what Hi-Crush looks like once it converts to a C-corp, even if the stock looks incredibly cheap today.